BEIJING—Chinese officials have urged Burma’s government to restart a Chinese-backed multibillion-dollar power dam project that was suspended apparently without notice last year. China was caught off-guard by September's suspension of the US $3.6 billion Myitsone dam, which was being built by a Chinese company in Burma. The project had drawn protests from ethnic and environmental groups, and the suspension marked a significant about-face in Burma’s domestic politics. The officials, speaking on the sidelines of China's annual legislative session, said the dam would produce badly needed electricity for Burma and raise living standards, the official China Daily reported on Sunday. It quoted a former head of the National Energy Administration, Zhang Guobao, as saying the dam is a good project that will bring local residents a better life. It also quoted Lu Qizhou, president of China Power Investment Co., which is providing the financing for the project, as saying the company will do all it can to avoid negative environmental impacts from its projects. "Myanmar is our friendly neighbor ... we hope to restart the project as quickly as possible," Lu said. Both Lu and Zhang are members of the Chinese People's Consultative Committee, an advisory body to the annual National People's Congress being held in Beijing. China and resource-rich Burma have historic ties, but the suspension of the dam project came as an apparent surprise to Beijing, which has long provided key diplomatic and economic support for Burma. Burma's President Thein Sein announced the suspension of the project on Sept. 30, drawing sharp criticism from the Chinese company behind the project but praise from activists who say it would displace many villagers and upset the ecology of the Irrawaddy River. It also would submerge a culturally important site in the ethnic Kachin heartland. 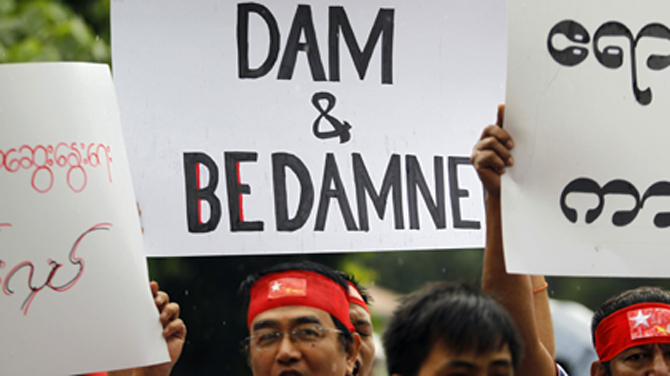 The dam has also been criticized because about 90 percent of the electricity it would generate would be exported to China, while the vast majority of Burma’s citizens have no power. Beijing has poured billions of dollars of investment into Burma to operate mines, extract timber and build oil and gas pipelines. China has also been a staunch supporter of the country's politically isolated government. China Power Investment Corp., which has threatened legal action over the move, is a state-owned company, and its website says it operates under the leadership of the State Council, which is China's Cabinet.